As Dean of St. George’s University School of Veterinary Medicine, Dr. Raymond F. Sis led the program from its infancy to its current position as a regional and international leader in veterinary medical education. 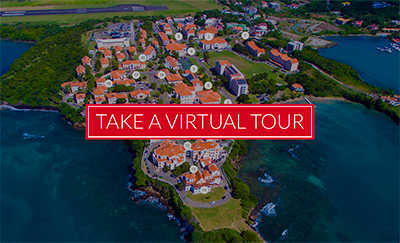 With his wife, Jan, at his side, Dr. Sis steered SGU through a rigorous accreditation process that included full accreditation by Grenada’s Ministry of Education and the American Veterinary Medical Association Council on Education. 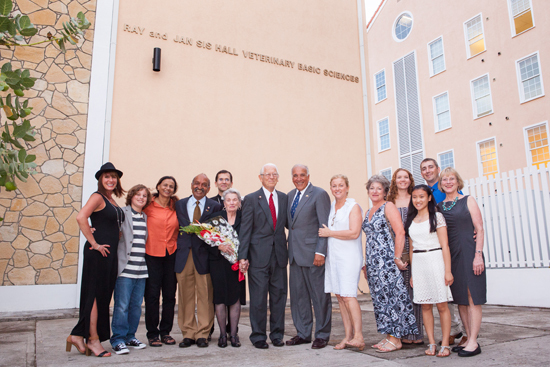 To honor the family’s impact on the University, the School of Veterinary Medicine’s Surgical Laboratory was renamed Ray and Jan Sis Hall in a ceremony held on September 1. Constructed in 2007, the two-floor building on the lower level of campus is comprised of two lecture halls and a veterinary medicine surgical lab that features state-of-the-art surgical equipment. His visionary efforts over his 13-year tenure at SGU did not go unnoticed as University Chancellor Charles R. Modica and Provost Allen Pensick paid tribute to his chivalrous attributes at an intimate ceremony outside the hall. Prior to joining SGU, Dr. Sis taught for 35 years at the College of Veterinary Medicine at Texas A&M University, where he led the Department of Veterinary Anatomy for 15 years. He is a Past President for several organizations, including the International Association of Aquatic Animal Medicine and American Association of Veterinary Anatomists. He also served on the National Advisory Panel of the North American Veterinary Medical Educational Consortium (NAVMEC) in 2010. Internationally recognized for his work in veterinary medicine, Dr. Raymond F. Sis has delivered more than 55 scientific presentations to veterinarians and veterinary students, and has authored and coauthored over 75 publications. Most recently he was selected by Kansas State University College of Veterinary Medicine for its 2013 Alumni Recognition Award. Dr. Sis also served in the United States Air Force for four years as base veterinarian and then became an environmental health officer in the Air Force Reserve for 25 years. He received the Air Defense Command Commendation and the Air Force Commendation Medal for his work in the Newcastle Disease Eradication Project in California in 1972. Upon retirement from the Air Force Reserve, he received the Air Force Meritorious Service Medal.